The National Weather Service's strategy of sending up extra weather balloons has worked. 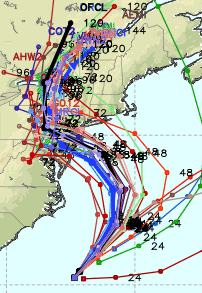 The models have pretty well clustered on a corridor for Sandy's center. 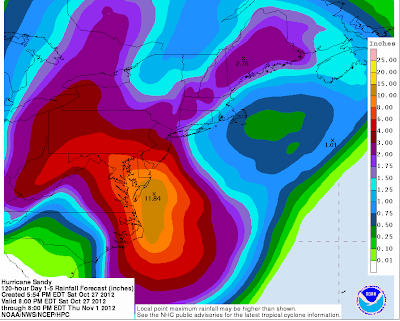 Very heavy rains will be moving inland with Hurricane Sandy. Areas with five or more inches of rain will likely see river flooding. Areas with heavier rain may see major flooding. All of the models show a major storm with damaging winds. Trees will topple -- and in areas with heavy rains -- there will be considerable tree uprooting and power line damage. 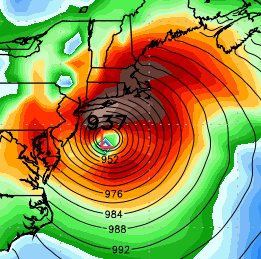 Here is the GFS model at six hour intervals. Keep in mind the system may come inland a little north or south of this path, so focus on the pattern rather than exact locations. The 937 millibar center would be an all-time record low barometric pressure. 8am Tuesday. Gusty winds still around Washington, D.C. 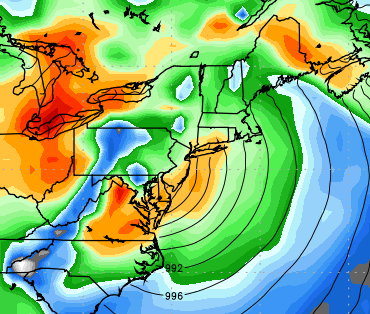 Note the strong winds around the eastern Great Lakes. Yes, there will probably be tornadoes but we cannot pin down the locations yet. 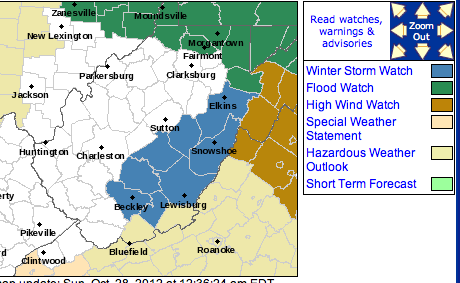 Finally, the blue is a winter storm watch where the snow accumulation will likely be measured in feet. The brown is a high wind "watch" (it should be a warning) and the green is a flood watch. So, that is the latest. I'll have an update in the morning. Addition from AccuWeather: Why you should evacuate in a hurricane. Could NOAA Be More Clueless? 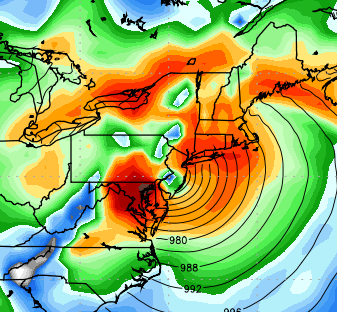 "The Most Important Forecast Since D-Day"
Do We Properly Value the Storm Warning System? How Much Damage from Hurricane Sandy? What Would You Do Without Power for a Month? "Storm Snuck Up on Us"
USA Today and WSJ on the same day!